FULL SIZE plans for 11 different flowers shown. Hardware parts package available separately. 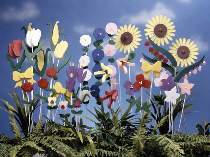 Garden Flowers Hardware is a 63-piece package which contains wood turnings and heart cutouts needed to build all 36 flowers as shown. Does not include the project plan, fiberglass rods for stems, paint or additional wood needed. Order #8638 fiberglass rods for stems separately.